After the unexpected sleeper success of the charming 2002 comedy My Big Fat Greek Wedding, which made $368 million worldwide against a $5 million budget and was even nominated for an Original Screenplay Oscar for its writer and star Nia Vardalos, CBS greenlit a TV sitcom based on the film called My Big Fat Greek Life, in which Vardalos and several members of the original cast reprised their roles. It was subsequently cancelled after only seven episodes when ratings continued to slip and critical reaction became extremely muted in comparison with the well-received film. 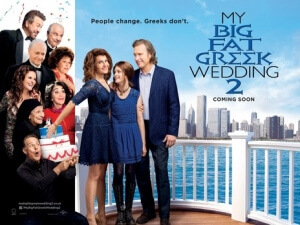 The reason we’re bringing it up at all is because My Big Fat Greek Wedding 2, the official theatrical sequel to the first one, feels exactly like a long-lost episode of that sitcom stretched out to feature length – but like most misfiring sitcom transitions to the big screen, it all resembles one long and not particularly funny episode instead of an actual film. The plot picks up some years on from the end of the last film, where we saw American-Greek woman Toula (Vardalos) meet, fall in love, and get married to non-Greek Ian Miller (John Corbett), all the while trying to survive Toula’s over-bearing extended Greek family. Now, same family sees a crisis unfolding when Toula’s parents Gus and Maria (Michael Constantine and Lainie Kazan respectively) learn that after all these years they were never officially married due to a plot contrivance missing signature on their wedding papers. Soon, it’s time to plan yet another big fat Greek wedding which aims to be bigger, fatter and Greek-er than before, all as Toula and Ian are facing a few marital problems of their own while also keeping a protective eye on their teenage daughter Paris (Elena Kampouris). Never mind the fact that fourteen years is a little too late to be bringing out a sequel to a film not many people seem to remember even existed, but it’s wildly unnecessary to even make a sequel to My Big Fat Greek Wedding in the first place. The first film had its own open-and-close story and character arcs, all of them wrapped up neatly by the time the credits started to roll, and wherever the story would lead next would be up to the audience’s collective imagination (unless you count My Big Fat Greek Life). Here, they seem to be plucking at straws to find a solid reason why there’s a sequel at all, even if it means repeating jokes and entire plots from the first one with no major changes, or at least none that spiritually feel different than before. In doing that, the film misses the heart and sincerity of the first one, so much so that by the time things start to wrap up you just want it to end instead of wanting to spend more time with these characters you don’t care as much about as you did before. More so than the actual movie it was based on, this film feels like a direct descendant of the short-lived sitcom, because every single scene and nearly every line of dialogue feels like it should come with its own little laugh track (they even leave a few pauses in between lines as though the editor forgot to actually insert them in), as we see what crazy shenanigans this wild and eccentric family end up partaking in next, whether it’s all unfairly ganging up to visit Paris at a college open day, or just having the mute grandmother suddenly appear in shots doing increasingly bizarre things without context, like waltz around in the street in a nightie and standing like a statue in a wedding dress shop window. It’s not really funny, it’s just bloomin’ odd. My Big Fat Greek Wedding 2 finds itself in a bizarre situation; it’s not so much a natural sequel to the first film which gained a significant amount of popularity, but rather a more natural follow-up to a short-lived TV sitcom that people are either fully unaware of, or want to pretend didn’t exist at all. It honestly doesn’t work as either, and we are left with yet another unnecessary product of another property’s popularity which doesn’t even come close to recapturing the magic or even the charm of what came before it. My Big Fat Greek Wedding 2 is a wildly unnecessary sequel that never justifies its purpose, rehashing jokes and storylines from the original instead of coming up with new material, and taking on a wackier tone that makes it all feel like a sitcom episode instead of an actual movie.